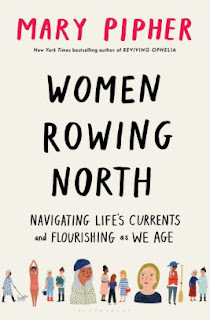 Even the subtitle of Mary Pipher's latest bestseller, Women Rowing North: Navigating Life's Currents and Flourishing as We Age, doesn't really do an adequate job describing how fascinating this book is. If you're a woman over sixty, you might want to read this. If you're a woman approaching sixty, Pipher provides hints as to how to live a successful, happy life after that age. Successful does not mean what so many people think when they see that word - "having achieved popularity, profit, or distinction". Successful, instead, means satisfied with what life has given us. Pipher is a psychologist who is over seventy herself. Her personal observations, her life experiences, and interviews and observations of other women led to this book. She examines issues women face as we move from middle age to old age. "This book focuses on the attitudes and skills we need in order to let go of the past, embrace the new, cope with loss, and experience wisdom, authenticity, and bliss." Granted, not every woman will accept her life or learn to live with it with grace. However, Pipher includes women of various economic groups and some with health issues to show that many of us have grown to a stage in which we don't need a lot to be happy, and we appreciate the lives we have. It's a book about courage and growing into wisdom. This isn't a flowery, self-growth book. This is a book that analyzes women's issues - the role of caregiver, the inability to say no, the disappearance of women over a certain age in the eyes of society, the aging body. At the same time, Pipher celebrates the ability of many women to learn to cope with changes in their lives. I'll admit, I cried at times in reading this book, and not because I know I'm in the last third of my life. I cried at some of the positive messages in the book, ones that struck home, or reminded me of people I love. One of the most important messages, for me, was "Almost every morning we can build a good day for ourselves." Contentment. Life. Satisfaction. Women Rowing North is filled with stories, suggestions, and people's mistakes. It's not a road map as to how to live life, but it certainly can be used as a tipsheet. And, I'll end with this. Now, I'm going to have to pick up a collection of William Stafford's poems. Pipher mentions a William Stafford poem begins with this line: "When they shook the box and poured out its chances, you were appointed to be happy." 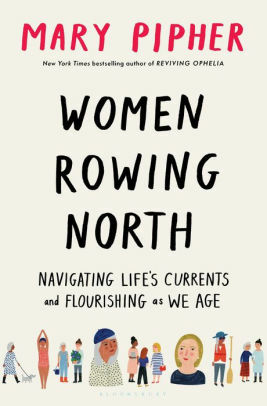 Women Rowing North: Navigating Life's Currents and Flourishing as We Age by Mary Pipher. Bloomsbury Publishing, 2019. ISBN 9781632869609 (hardcover), 262p. My library has this book! I will be turning 59 next month, so this is now on my TBR list. Thank you for reviewing it. Oh, I like the sound of this one, Lesa! And I'm also at that age. This is the same Mary Pipher that wrote REVIVING OPHELIA I guess. I read that book a really long time ago when my daughter was younger. Thanks for featuring it and I'm off to see if the library has ordered it. Perfect timing, Deb, before you get there! I hope you enjoy it as much as I did. I bet they've ordered it, Kay. And, yes, it is the same Mary Pipher. My best friend said she swore by that book when her daughter was growing up. So much yes to this! I'm edging up there and have been addressing so many of these issues. I will definitely be reading this book. Also, someone mentioned she wrote Reviving Ophelia, and I too, read that when my daughters were young. Loved it. Thanks, Lesa. Yes, you're right, Shannon. She did write Reviving Ophelia. Darn, I'm sure my sister wishes she had known about that when her daughter was young. This sounds like something I can relate to, Lesa! I think I'm doing a fairly good job of rebuilding my life, but I can always use some inspiration. I'll look for it at the library. Whoa! One of my libraries has 70 holds on this book, and the other 18. I might need to buy it after all. Thank you for this Lesa. I have it on reserve at my library. Mary Pipher and book on older women = bestseller. And, it's an easy book to read. I'm impressed with the number of holds. I checked it out here before people had heard about the book. I just bought it on Kindle! Kind of expensive for a Kindle book, but I think it will be worth it. Thanks for the recommendation, Lesa. You're welcome, Margie. I think it will be worth it, and it's a book you might return to now and then.